Thanks to MichaelBay.com, the vehicle mode of fan favorite Barricade has been revealed! This confirms that the character will be returning to the live action universe, in what manner we will have to wait and see. 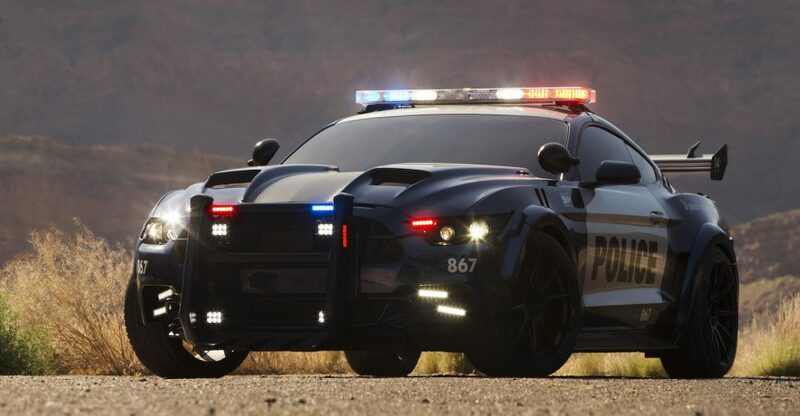 The police vehicle is looking sharper and meaner than ever, capturing an intimidating look unrivaled in prior movie installments. We also learned recently that the filming currently ongoing in Arizona does feature this vehicle, hopefully leading to a larger role in The Last Knight. Movie news season is in full swing! Stay tuned here as it continues to pour in! I just said it:he showed up in the Battle Of Chicago footage that Attinger showed to those guys. I'm not sure but I think Max Prime realizes this is Barricade but is wondering if he is still a decepticon since no obvious con logo is present on the car. Yes, thats what I was proposing with my question. However it is all speculation in these early days, it would be interesting to see if the lack of 'Con logo means anything. You know I totally forgot that Barricade showed up in TF4. She said that because someone in the comments told her it was Hound. Whilst checking out the photos of the new Barricade car model i noticed there were no decepticon symbols that could see?! This thread has been answered by Michael Bay and Nelson. Thank you, Michael Bay and Nelson. *hands together in prayer* God, bless you both. He still has to punish and enslave on him so I don't think he'd have a different role. Looking at the lines of the car I really don't see a good place they could have put it except maybe the center of the hood, maybe the front fenders below the 911 but it would need to be rather small. It might also be they didn't want to reveal him so soon either and were hoping he'd be mistaken for an ordinary cop car or a new character. The pics from the rear quarter and even the side that went out before the reveal were slightly blurry so you couldn't quite make out the motto on the back but based on some of the loops and curves in the writing could still guess what it said, meanwhile the other car pics were rather crisp and clear leading to believe any blurring done was intentional. Guys, quite clearly reoccurring characters in the last three movies are just a plain simple re-use of a CGI model… I really doubt there was any thought put into it. And considering that Frenzy was BOTH BLUE AND RED in the toy lines, they better make Rumble Bulky and Frenzy Skinny. Yeah, let's hope they don't give barricade a very long neck then! I laughed too hard at your response. LOL. As AOE pointed out, a Cybertronians life force, soul,memories, etc…..is in their spark. So long as that spark is not damaged, its possible to restore that life. Of course, Bayverse is like Supernatural (tv series), nobody ever stays dead. They have an irrevocable Get Out Of Death Forever card. My head cannon is that Swipe, Dino, Topspin, Roadbuster, Jolt and Chromia all decided to leave Earth on a mission to meet up with Ultra Magnus and others. That is where I want them to stay, far far away from Bayverse. I also like to think they took Jazz with them.